The lack of sustainability of community-managed drinking water systems is a major concern in low- and middle-income countries. While water system breakdown is inevitable, some water systems continue to be rehabilitated and provide water for decades while others fail permanently shortly after implementation. 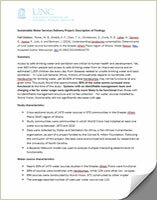 Previous studies have shown that water committees and fee collection are critical to sustainability (Fisher 2015, Foster 2013). This study examined successful water systems to identify processes for sustainability. The Water Institute at the University of North Carolina-Chapel Hill (UNCCH) and World Vision have established an innovative partnership to improve water, sanitation, and hygiene (WASH) interventions in low- and middle-income countries with the ultimate goal of helping solve the global water and sanitation crisis by 2030, in support of our shared belief that every child deserves clean water. Water continues to flow from World Vision water points because of our integrated community engagement model. 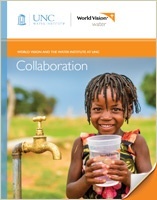 One of the premier academic groups in water research, the University of North Carolina Water Institute, conducted an independent study examining 1,470 water sources in 570 communities located in the Greater Afram Plains of Ghana, where World Vision has been providing wells since 1985. Nearly 80 percent of World Vision wells studied continued to function at high levels even after 20 years, thanks largely to our community engagement model. 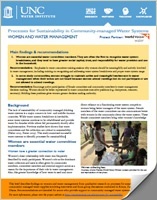 Consistent with this community approach to sustainability, research showed that an identified water committee and evidence of charging a fee for use of the water were the main reasons associated with the continued functionality of the water points. These best practices, including training local people as mechanics to repair pumps when they break down, are part of the reason why World Vision wells set the standard for sustainability. This study found that the odds of non-World Vision water sources being functional decreased by 2 percent each year, whereas the functionality of water sources installed by World Vision did not significantly decrease with age.